Did the British hook the Indians on tea? 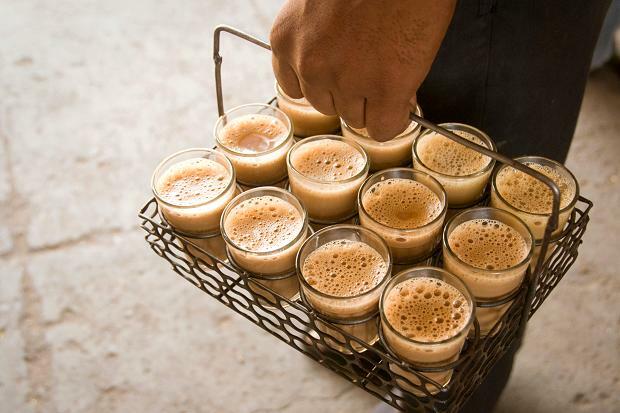 It’s you British who got us addicted to it,” said my Rajasthani friend Shukla, as he downed what must have been his tenth cup of tea of the day. I’ve never seen so much tea-drinking as there is in northern India: there seems to be an espresso-sized shot on offer every 30 minutes or so. Even in the shacks of the impoverished farmers we were there to interview, a tray of perfectly brewed little cups of strong, sweet tea flavoured with a little ginger arrived as soon as we sat down. (So unlike a visit in Edinburgh, where the classic greeting is “You’ll have had your tea, then?”) The Rajasthanis do make very good tea — though heavy on the sugar — and we could learn from them. I got a lesson at the kerbside stall of Mrs Morbadi, a chai-wallah in the city of Jaipur. The key thing is that she boils the tea, rather than just putting boiling water on the tea — and making tea with water that really is near boiling point is crucial, something that a lot of European cultures ought to learn. French hoteliers: you can’t make decent tea with semi-hot water from a Thermos, OK?